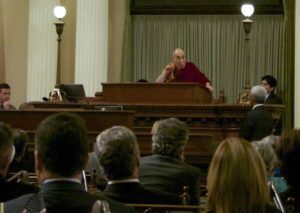 The Tibetan spiritual leader His Holiness the Dalai Lama Monday addressed a joint session of the California Legislature in Sacramento where he stressed the importance of sense of community and well being of seven billion human being. “We are social animal and the sense of community is very essential. All of us must think of well-being of the entire seven billion human beings. Time has come for us to think about global well being,” said the Dalai Lama. The Tibetan leader added that more happiness, peace and compassion on global level will bring maximum benefit to humanity as a whole. “Different nationalities, faiths and ranks are secondary level of differences. On the fundamental level we are all the same. We are born the same way and we die the same,” the spiritual leader said. His Holiness stated that California with its multi-cultured society has the ‘positive potential’ to create genuine harmony.He also appreciated initiatives taken by the state on environmental issues. Social animal – Human beings are social animals. Human lives depend on other humans because of poverty and greediness. 4.There are still countries that are free from social animalism notion and influence riding. 5.United States of America has seen the severe impact of homosexuality and transgenderism on people’s lives, governance,professional lives,education and financial life.